Something I never expected when I started this series of dictionary drawings is the interest it would generate from other teachers. I get inquiries about my work from teachers and students everywhere - even places on the globe I've never heard of. Crazy - right? I am delighted that kindergarten to high school kids are painting and drawing on rescued book pages. As a public school teacher I am constantly online searching for new ideas for my students and when I'm going through galleries and art shows I am often inspired for a new lesson when I find another artist's inventive work. I sure never dreamed that something I do would be replicated by fellow educators. Yesterday I was contacted by a great online resource for teachers asking permission to post information about my dictionary art. If you are an art teacher of any kind, you need to check out their great resources. 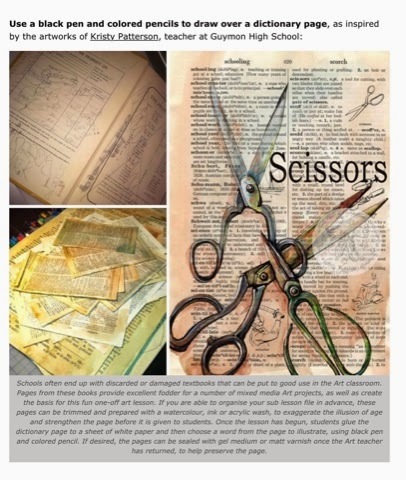 My work was included as an idea for substitutes....something every art teacher struggles with. 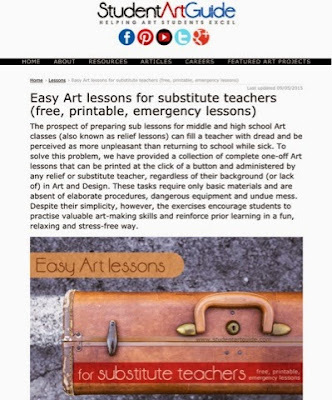 It's nearly impossible to leave your room in the hands of a substitute (no matter how good that person might be) and trust that art supplies and materials are going to be okay afterward. I usually opt for worksheets so I don't have to return to find my brushes destroyed, the room splattered in paint and my desk ransacked.